As Strikes Wane, Caterpillar Workers Hold The Line About 800 machinists at an Illinois Caterpillar plant are entering their third month on strike. Strikes of large numbers of workers were relatively common in the 1970s, but today, work stoppages of this size — and this length — are rare. 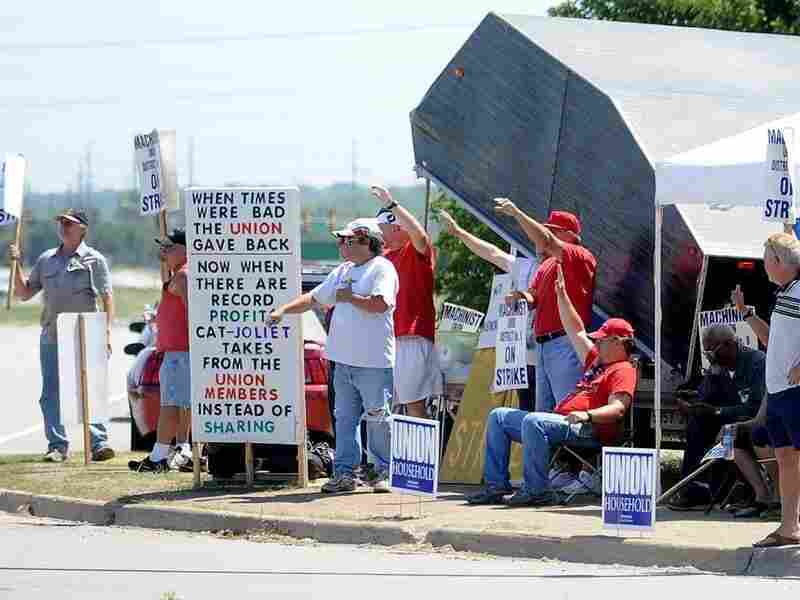 Striking workers picket outside a Caterpillar plant in Joliet, Ill. The work stoppage is now entering its third month. These machinist union members rejected Caterpillar's offer earlier this year: a six-year contract that would freeze wages for most workers while sharply increasing health care costs and cutting pension benefits. Joe Ahern, on the negotiating committee for the Joliet Local 851 of the International Association of Machinists, says Caterpillar's offer "really kinda was a sucker punch to me." Ahern says the company never truly negotiated with the workers. Through the negotiation process, he says, Caterpillar management rarely tried to find common ground. "It was always, 'This is our last, best and final,' " Ahern says. "And it was sad that way." We don't see a lot of strikes by large bargaining units that go on for more than 24 hours. ... This is a throwback. What Ahern finds particularly insulting, he says, is that Caterpillar earned record profits last year — and is on pace to do so again. "This company is a global leader," Ahern says. "And I don't understand why they wouldn't want to see their employees paid that way ... or why they have to be below the bar on their wages and benefits." In an emailed statement, a Caterpillar spokesman says "the company has offered what it believes is a fair, reasonable and comprehensive proposal," and that it has "exhausted the negotiation process." Caterpillar is now trying to hire temporary replacement workers to keep the plant running. Robert Bruno, a labor employment relations professor at the University of Illinois, says this strike is anomaly. "We don't see a lot of strikes" in general these days, Bruno says, much less ones by large bargaining units. And "we don't see a lot of strikes by large bargaining units that go on for more than 24 hours, a couple of shifts, a week," he says. "This is a throwback," Bruno says. During the 1970s and early 1980s, there were hundreds of strikes of more than 1,000 workers each year in the U.S., according to the U.S. Bureau of Labor Statistics. But in 2009 — at the height of the recession — there were only five. That number has ticked up to 19 strikes in 2011, but even so, unions have largely lost their punch, Bruno says. "Clearly, labor has its back up against the wall in the private sector as well as the public sector," he says. "And the fights in the public sector — particularly those in the Midwest — have had an impact on the state of mind of lots of union workers." Caterpillar has a history of using hardball tactics against its unions. The company wore down its largest union, the United Auto Workers, during a long and bitter strike in the 1990s. The workers eventually were forced to take deep concessions. And earlier this year, Caterpillar closed a plant in London, Ontario, when the union there balked at pay cuts. But the standoff in Joliet appears to be a rare case, Bruno says. Union workers, who have already made significant concessions, feel they have little more to lose by drawing a line in the sand. But the work stoppage comes at a cost, and the workers are hurting. Most are earning only $150 a week in strike pay. No new negotiations are currently scheduled in Joliet, although the union says it's ready to negotiate at any time. For now, the workers insist that this strike is part of a larger struggle for workers: fighting for the right to earn wages that will keep them in the middle class.